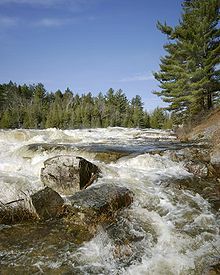 The term freshet is most commonly used to describe a spring thaw resulting from snow and ice melt in rivers located in the northern latitudes of North America. A spring freshet can sometimes last several weeks on large river systems, resulting in significant inundation of flood plains as the snowpack melts in the river's watershed. Freshets can occur with differing strength and duration depending upon the depth of the snowpack and the local average rates of warming temperatures. Deeper snowpacks which melt quickly can result in more severe flooding. Late spring melts allow for faster flooding; this is because the relatively longer days and higher solar angle allow for average melting temperatures to be reached quickly, causing snow to melt rapidly. Snowpacks at higher altitudes and in mountainous areas remain cold and tend to melt over a longer period of time and thus do not contribute to major flooding. Serious flooding from southern freshets are more often related to rain storms of large tropical weather systems rolling in from the South Atlantic or Gulf of Mexico, to add their powerful heating capacity to lesser snow packs. Tropically induced rainfall influenced quick melts can also affect snow cover to latitudes as far north as southern Canada, so long as the generally colder air mass is not blocking northward movement of low pressure systems. In the eastern part of the continent, annual freshets occur from the Canadian Taiga ranging along both sides of the Great Lakes then down through the heavily forested Appalachian mountain chain and St. Lawrence valley from Northern Maine into barrier ranges in North Carolina and Tennessee. In the western part of the continent, freshets occur throughout the generally much higher elevations of the various west coast mountain ranges that extend southward down from Alaska even into the northern parts of Arizona and New Mexico. A flood resulting from heavy rain or a spring thaw. Whereas heavy rain often causes a flash flood, a spring thaw event is generally a more incremental process, depending upon local climate and topography. A stream, river or flood of fresh water which empties into the ocean, usually flowing through an estuary. A small stream of fresh water, irrespective of its outflow. A pool of fresh water, according to Samuel Johnson and followed in Thomas Sheridan's dictionary, but this might have been a misinterpretation on Johnson's part, and it is at best not a common usage. Freshets are the result of the mass delivery of water to the landscape, either by snowmelt, heavy rains, or a combination of the two. Specifically, freshets occur when this water enters streams and results in flooding and high flow conditions. When freshets occur in the winter or early spring, the frozen ground can contribute to rapid flooding. This is because the meltwaters cannot easily infiltrate the frozen surface and instead run overland into rivers and streams, leading to a rapid flooding response. Deeper snow packs with large snow water equivalents (SWE) are capable of delivering larger quantities of water to rivers and streams, compared to smaller snowpacks, given that they reach adequate melting temperatures. When melting temperatures are reached quickly and snowmelt is rapid, flooding can be more intense. In areas where freshets dominate the hydrological regime, such as the Fraser River Basin in British Columbia, the timing of freshets is critical. In the Fraser River Basin, the annual freshet was observed 10 days earlier in 2006 compared to 1949. In these areas, earlier freshets can result in low flow conditions later in the summer or fall. Freshets may also occur due to rainfall events. Significant rainfall events can saturate the ground and lead to rapid inundation of streams, as well as contributing to snowmelt by delivering energy to snowpacks through advection. In the tropics, tropical storms and cyclones can lead to freshet events. The magnitude of freshets depends on snow accumulation and temperature. Smaller freshets have been associated with El Niño conditions, where the milder conditions lead to lower snow accumulations. The opposite is true under La Niña conditions. Runoff from freshets is a major contributor of nutrients to lakes. In La Niña conditions with stronger freshets, higher runoff, and high nutrient inputs, more positive ecological indicator species (Arcellacea) are present in lakes, indicating lower levels of ecological stress. In El Niño conditions, smaller freshets contribute less runoff and result in lower nutrient inputs to lakes and rivers. In these conditions, fewer positive ecological indicator species are present. Migratory fish, such as salmon and trout, are highly responsive to freshets. In low flows present at the end of freshets, fish are more likely to ascend streams (move upstream). During high flows at the peak of a freshet, fish are more likely to descend streams. Freshets are often associated with high levels of dissolved organic carbon (DOC) in streams and rivers. During base flows, water entering streams comes from deep in the soil where carbon contents are lower due to microbial digestion. During a freshet, water is more likely to run overland, where it dissolves the abundant, less degraded carbon present in the uppermost soil layers before entering streams. High dissolved organic carbon (DOC) levels lead to an increase in the net primary productivity of the stream by enhancing microbial growth. The 1997 Red River Valley Flood was the result of an exceptionally large freshet fed by large snow accumulations which melted due to rapidly warming temperatures, producing large volumes of meltwater which inundated the frozen ground. At the peak of the flood, the Red River reached a depth of 54 feet (16.46 meters) and a maximum discharge of 140,000 cubic feet per second (3,964 cubic meters per second). This event has been referred to as “the flood of the century” in the areas impacted. The Fraser River in British Columbia experiences yearly freshets fed by snowmelt in the spring and early summer. The largest freshet ever experienced in the Fraser River occurred in 1894 and resulted in an estimated peak discharge of 17,000 cubic meters per second (600,349 cubic feet per second) and a peak height of 11.75 meters (38.55 feet) at Hope, BC. However, due to the low population this flood had a minor impact compared to the second largest flood in 1948, which had a peak discharge of 15,200 cubic meters per second (536,783 cubic feet per second) and a peak height of 10.97 meters (36 feet) at Hope, BC. The 1948 flood caused extensive damage in the lower Fraser Valley and cost 20 million dollars at the time. In 1972, the Susquehanna River which flows into Chesapeake Bay experienced a considerably large freshet due to Tropical Storm Agnes, resulting in flooding and increased sedimentation in Chesapeake Bay. At the peak of the flood on June 24, 1972, the instantaneous peak flow was greater than 32,000 cubic meters per second (1,130,069 cubic feet per second), and at the mouth of the river, the concentration of suspended solids was greater than 10,000 milligrams per liter. ^ "What is Snowmelt?". Alberta WaterPortal Society. Retrieved February 8, 2019. ^ Gieck, Jack (1988). A Photo Album of Ohio's Canal Era, 1825–1913. Kent State University Press. pp. xvii. ^ a b Brown, Lesley (1993). The New shorter Oxford English dictionary on historical principles. Oxford [Eng. ]: Clarendon. ISBN 0-19-861271-0. ^ Bonnier Corporation (January–June 1907). Popular Science. Bonnier Corporation. pp. 68–. ISSN 0161-7370. ^ Samuel Johnson (1773). A Dictionnary of the English Language. pp. 196–. ^ Thomas Sheridan (1789). A Complete Dictionary of the English Language, Both with Regard to Sound and Meaning ...: To which is Prefixed a Prosodial Grammar. C. Dilly. pp. 286–. ^ Timothy Dwight (1822). New-England and New-York. pp. 286–. ^ Pomeroy, John; Fang, Xing; Ellis, Chad; Guan, May (June 2011). "Sensitivity of Snowmelt Hydrology on Mountain Slopes to Forest Cover Disturbance". University of Saskatchewan Centre for Hydrology. ^ Curry, Charles L.; Zwiers, Francis W. (2018). "Examining controls on peak annual streamflow and floods in the Fraser River Basin of British Columbia". Hydrology and Earth System Sciences. 22: 2285–2309. doi:10.5194/hess-22-2285-2018. ^ Kang, Do Hyuk; Gao, Huilin; Shi, John Xiaogang; Islam, Siraj ul; Dery, Stephen J (January 2016). "Impacts of a Rapidly Declining Mountain Snowpack on Streamflow Timing in Canada's Fraser River Basin". Scientific Reports. 6: 19299. doi:10.1038/srep19299 – via ResearchGate. ^ Shook, Kevin; Pomeroy, John (2012). "Changes in the hydrological character of rainfall on the Canadian prairies". Hydrological Processes. 26: 1752–1766. doi:10.1002/hyp.9383. ^ Shook, Kevin; Gray, D.M. (1997). "Snowmelt resulting from advection". Hydrological Processes. 11: 1725–1736. doi:10.1002/(SICI)1099-1085(19971030)11:13<1725::AID-HYP601>3.0.CO;2-P.
^ Arenas, Andres Diaz (1983). "Tropical storms in Central America and the Caribbean: characteristic rainfall and forecasting of flash floods" (PDF). Proceedings of the Hamburg Symposium. ^ a b Neville, Lisa; Gammon, Paul; Patterson, Timothy; Swindles, Graeme (May 2015). "Climate Cycles Drive Aquatic Ecologic Changes in the Fort McMurray Region of Northern Alberta, Canada". GeoConvention 2015. ^ Huntsman, A. G. (January 1948). "Freshets and Fish". Transactions of the American Fisheries Society. 75: 257–266. doi:10.1577/1548-8659(1945)75[257:FAF]2.0.CO;2. ^ Meyer, J.L. (1994). "The microbial loop in flowing waters". Microbial Ecology. 28: 195–199. doi:10.1007/BF00166808 – via SpringerLink. ^ Voss, B.M. ; Peucker-Ehrenbrink, B.; Eglinton, T.I. ; Spencer, R.G.M. ; Bulygina, E.; Galy, V.; Lamborg, C.H. ; Ganguli, P.M.; Montluçon, D.B. (2015). "Seasonal hydrology drives rapid shifts in the flux and composition of dissolved and particulate organic carbon and major and trace ions in the Fraser River, Canada". Biogeosciences. 12: 5597–5618. doi:10.5194/bg-12-5597-2015. ^ Heidorn, Keith (April 1, 2011). "The 1997 Red River Flood". The Weather Doctor. ^ Nelson, Mark. "1997 Red River Flood". Flood Mitigation of the Red River Floodplain, Grand Forks, North Dakota. ^ a b "Comprehensive Review of Fraser River at Hope Flood Hydrology and Flows Scoping Study – Final Report" (PDF). BC Ministry of Environment. October 2008. ^ "Flooding events in Canada: British Columbia". Government of Canada. December 2, 2010. ^ Schubel, Jerry R. (1974). "Effects of Tropical Storm Agnes on the Suspended Solids of the Northern Chesapeake Bay". Marine Science. 4: 113–132. doi:10.1007/978-1-4684-8529-5_8 – via SpringerLink. An example of usage of the term "freshet" is shown in the text on a historic marker at Durgin Bridge near Sandwich, New Hampshire.